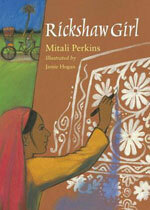 Rickshaw Girl by Mitali Perkins is a short children’s novella that gives a glimpse into the life of a girl in Bangladesh, struggling against poverty and gender stereotypes. We also get to see the art and beauty of Bangla culture through the alpana, geometric and floral patterns painted by women during celebrations. The sparse, black and white illustrations in the book give a good taste, but a quick Google image search really shows the beauty, intricacy and exactness of the art. Rickshaw Girl is a window into a different culture and illustrates the power of micro-loans as empowerment over poverty. Previous Post8th Grade Super Zero Explores Homelessness & DorkinessNext PostGrasshopper Jungle: Funny/Honest Teen Novel Meets Mutant Insects!